Hello all. Some of you probably already know this, but from Dec. 2, 2017 to Dec. 13, 2017 (that’s today), Likewise.blog was down and was unable to be accessed. I’m back up now, though, and again you’re able to access all of my delicious writing. If net neutrality is struck down then I’ll surely lose a lot of viewers, but for now, look out for more of my work to come soon! I actually have a few things planned, that I should be talking about more later. Hello all, and happy Thanksgiving time! For those of you who recognize it, that is. So, I know I’m keeping up the pattern of sparsely posting here and neglecting to keep up. I actually was about to make a post yesterday, about my experience working at a haunted house; sort of a late Halloween season-themed post. But then, I made a decision. I remember why I made this blog—to share all of the awesome writing, art, and spiritual concept I love. And I realize that I’m starting to stray farther from that that I’d thought. So now, I’m collecting a bunch of different writing ideas from you guys and doing some of them, and putting them here on my blog. This is a good way for me to what people are interested in and to continue with my writing at the same time. It’ll be fun to see what you guys want to see, and I’ll have a great time making your ideas come to life. I do also have some ideas of my own that I’m working on, and I’ll still work on those as well, but I’d still like to take on some new ones. So if you have anything that you want to be done, any poems or short stories, send your ideas my way! Poems and short stories are my forté, and you can check out some of the other things I’ve done by searching throughout this blog. Have an amazing day, and I can’t wait to hear all of your wonderful ideas! Hello all, and happy Halloween! Today is my favorite holiday of the year, and I’m happy to celebrate it. Trick-or-treating is just about over on my end, but I would still like to say a little bit about what Halloween has been like throughout my life. Halloween has always been something I’ve gotten excited about. Above you can see me in my go-to costume that I wore for years—the lion. My twin brother went as a tiger and my older brother used to go as Charizard. There was a local Halloween parade that we went to every single year, throwing out candy and having us catch it in our bags. And later on we would get to walk around to the stores and have things handed out to us by the store owners. There were these nice people that would give us fortune cookies every year and I distinctly remember looking forward to that. I still remember the most memorable house I ever went to. It was in my old neighborhood, probably 12 years ago. I walked up to the house as usual, and when I get there, I see these people absolutely all out. There was a load of candy there and beautifully done decorations inside and out. I’d know the inside because they invited me in just inside the doorway. And, right after I grabbed my Crunch bar from the bowl, someone pops out from the side and growls “grab your candy and run!”. And that’s exactly what I did. I made a run straight for my dad because I was so scared. Nowadays, things are more tame because of my age and my location in my new neighborhood. I’m mainly focused on my candy, which we bought way too much of this year. I was supposed to go trick-or-treating for the last time today, but I held off and handed out a large amount of candy to a small number of people. It’s alright though, and although I got pretty let down from the amount of kids and the Halloween parade was supposed to be cancelled due to rain, I’m hoping next year will be better. I also worked at a haunted house this year, but more detail on that later! For now, have a great night, enjoy your (or your kids’) candy, and count down the days till next year. I became a college student this week. Yes, it’s true, and I can imagine what you’re thinking right now. “It’s the end of September! What kind of school are you going to that starts their classes so late?”. And if I were you, I’d be thinking the exact same thing. But I will explain. My classes did in fact start last month – August 28th, to be exact. It happened, but I’d say that I was quite unprepared for college. The summer was not focused on my education, but rather my excessive sleep and several empty promises. I sort of lost my way, I guess. High school tired me out so much and I didn’t know what exactly I wanted to do with myself. I didn’t even decide for sure where I was going to college until early/mid August, and before then, my plan was to just get a job, earn some money and go with the flow. But it wasn’t as easy or as simple as I thought. I had to choose college in order to have some order and a foundation in my life. Well, in short, it wasn’t so hot at first. The first day felt normal in an odd way; I hadn’t at all absorbed what was going on. I wasn’t as there as I should’ve been. The whole week was like that, and I just went along with it, treating it as something that I had to just get up and do. And I thought that that would be the whole college experience, and I was thoroughly disappointed. I felt like I didn’t fit in there, like everyone knew what they were doing besides me. But things got better on their own. Earlier on I’d agreed with myself that I’d try my hardest to make something out of the college experience, to not squander it and get good grades and to actually do something. So I guess that’s when I started having to implement it. More and more work got assigned, and I had to adapt. And this week is when I realized, it happened. It wasn’t like I instantly became aware and successful in college life, but that I came to a realization. It was just after class on Wednesday, and I was sitting right outside of the library, and I was thinking about all the things I had done. I just left class early. I worked on my homework and studied by myself. I saw a cute girl and wanted to say hi. I evaluated what my days had been spent doing and I realized: I was a college student. The way I acted and the things I did finally reflected it. At that moment I felt it, and it was different than how I’d felt on the 28th of August. And it was okay. Now I hope I’ve avoided turning this into a meaningless babble about my recent college experience. But I hope you guys understand my feelings, and I’d love to know if any of you have been through anything similar. Comment below with questions or comments; I love to hear about other people’s experiences as well. Parting is such a sweet sorrow! Our last few hours in the province of Quebec, the bus ride home, and then the arrival back at our school. I’m gonna miss this place, but all good things must come to an end. Perhaps I’ll travel here again in the future. Saying goodbye to Annie right after breakfast! The bus ride home was nice, long and relaxing. It was a nice break from the large amount of walking and standing that we’d done over the past few days. Saying goodbye to John, our bus driver. He was really nice and I’m going to hmiss him! I can tell he has a really kind heart. Dunn’s, a breakfast place we went to on the way out. To go, as you can see. French toast with cantaloupe, strawberries, and an orange slice. We stopped at a rest stop, and I chose to go to Quiznos. I got a chicken, bacon and cheese sandwich on parmesan bread. It was really good! Nothing! We were home long before dinnertime rolled around. Honestly, arriving home. The trip was nice, of course, but it was nice to arrive home and get back into the swing of things! Hey guys! Just a quick post to notify you that my book, The Month Of June, is now available on the Barnes and Noble website! It will hopefully soon be in physical stores, but you can still buy it here. It will also soon be available on Nook and Nook devices! Hello all! I wasn’t originally going to post about this, but I thought it would be a good idea to because of the good photos I took. 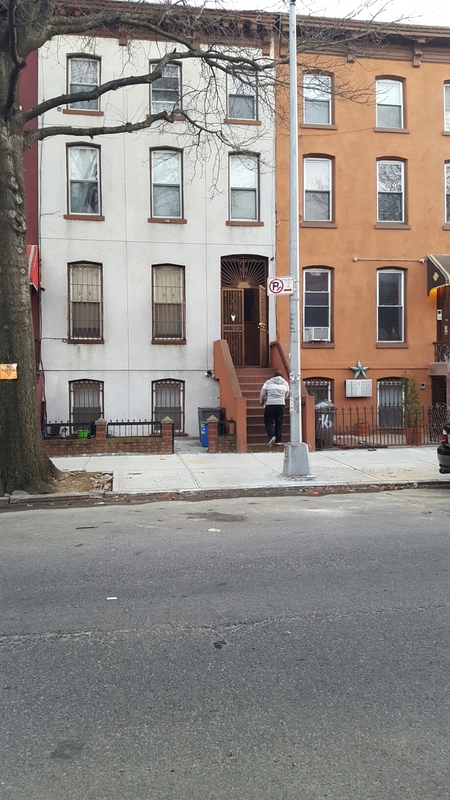 I visited New York on Sunday to go to the Bed-Stuy area with my mom, dad, and twin brother, in order to visit my grandmother. It was a very interesting trip, really. We took the rental car so my dad wouldn’t ding up his brand new one, and hit the road on a 2.5 hour road trip! On the way there, we made two stops. One to Dunkin’ Donuts, where I got some munchkins and a heart-shaped creme filled donut. They messed up my order on the munchkins, though, so I was left hungry with nothing but those soft squishy air balls that they call ‘glazed donut holes’. The second stop was to an average rest stop. I was going to get a stromboli, but I decided to save my appetite, in order to possibly get some good local food. After the long drive with me occupying myself with some reading, music, and proofreading one of my works, we arrived. This is the exact spot outside of the townhouse that my grandma lives here. I must admit, this photo was taken on the way out, rather than when we first arrived. Still, after we all walked in, we quickly settled down and got into our normal family conversation. Here’s a panorama of the main area of the house. Pretty nice, if I may say so myself! I’ve been visiting here at least once or twice a year since I was born, so I know this area very well. I used to hate coming here. I used to dread the long car rides, the lack of tv or internet, and some annoying relatives, to say the least. I’d groan when I heard it was visiting grandma, and would try to pull tricks to get me to stay home. But now, it’s an accepted necessity, and I even surprised myself with how patient I was this time around. We spent the time talking and catching up, and although it wasn’t much, I actually enjoyed myself. This video pretty much sums up how the entire visit went. My sweet old grandmother and my family and I, and we all caught up and had a good time. We talked about how much we’ve grown, what we’ve accomplished, general small talk, and as you can see, I told her about my book, The Month Of June. It went on like that for a few hours. I took a nice 3-hour nap at around midday, and I also talked to my severely autistic cousin, junior. It really shows how much I’ve matured. I remember many times when I was younger, running around and finding any way I could to entertain myself with my brothers, trying to ignore all family contact. It sort of makes me feel like one of the adults now, being able to sit down calmly and have simple conversations. Unfortunately, I didn’t get to do nearly as much as I wanted to. I wanted to take some time to see the Statue of Liberty, Wall St., and possibly the World Trade center. Additionally, the trip ended on a slightly sour note, since before we got out of the city we had a little fender bender that kept us stuck there for another 2 hours or so. But it was still a really good experience, and on the way home I went to a rest stop and tried a Nathan’s hot dog for the first time. The next time I visit, I’ll be sure to do and see much more, and blog about the whole experience right here!